Over the weekend, I had the pleasure of watching the Clarence DeMar marathon finish in Keene, New Hampshire. It's only about an hour away from my humble abode in Concord and most importantly, THE ShirleyPerly was running it, so I got a chance to meet her in person. I got there around 10 AM, 2 hours into the marathon. I had expected to see a bustle of activity with people running around trying to take care of any last minute fires. That couldn't have been further from the truth. People were just hanging out and it was very quiet. The first runner finally came in at 2:40 and the crowd (about 20 people) cheered. Then another and another. There was a small group that came in just before 3 hours. And then people started to filter in as the time went from 3 to 4 hours. This is the first time I've witnessed a marathon finish purely as a spectator. And let me tell you, it's something all of you should do at some point. I saw a lot of stuff that will stay with me for a while. Specifically? Well fine, since you asked. I was struck at how emotional the scene was and how much it reminded me of my marathon. I was beyond elated and very emotional as I crossed the finish line. Even re-reading my race report today still takes me back to the emotion I felt. Standing at the finish line is just one of those amazing experiences that you wouldn't really understand unless you've been there. I stood next to a family that was waiting for their dad/husband to come in. They had raced from another part of the course to see him at the finish. The Boston Qualifying (BQ) time was 3:20:59 for his age group. They were getting more and more nervous. They saw 3:20 come and go and they were heartbroken. To see him round the corner only a minute later to finish at 3:22:20 was just heartbreaking. So much training to just miss BQ. I watched a woman finish around 3:50 when she had absolutely nothing left. As she came around the corner in the last .2 miles to the finish, her legs started to buckle and she could barely stand up. Another runner had her arm around her shoulder to keep her upright. Her body had clearly given up but she wasn't willing to sacrifice her good time for the sake of her body. Thankfully there was medical staff there to help. And then came Shirley at 4:08:25. It was such a thrill to finally see her and meet her because she's been a tremendous inspiration to me and many others. We chatted for a little while about my upcoming race and training, travel, etc. That alone was easily worth the quick drive. A very non-busy finish line at 2:15. The first runner wouldn't come in for another 30 minutes. THE ShirleyPerly as she was finishing. Apparently my shutter speed was too slow to catch her lightning fast speed at the end. I just completed my first 3-a-day run in preparation for 48 Miles in 48 Hours. I did it to test my body and try out different things prior to the big day(s). I ran 4.43, 5.12 and 5.82 respectively from this morning to this evening for a total of 15.37 miles and about 2,100 calories burned. I ran at 10 AM, 2:30 PM and 5:30 PM. That was a mistake. First, I should have gotten up and out earlier than 10 AM because when I got back I had to eat breakfast and then lunch an hour or two later. Second, I had two pieces of chicken for lunch (50g of protein) and ran an hour later. Big mistake. I need to give myself a couple of hours to digest because it felt like a rock in my stomach. Third, by the time I got back from the middle run, I had a little over an hour to rest before going back out. I need more time to rest. That said, all things considered, I'm tired but not exhausted. 3 8-milers in a day will be tough, but going back the next day and continuing will be even tougher. I'm confident that I'll be able to do it but it will be quite a challenge. OK, time to replenish some calories. I'm planning a dinner of two pieces of chicken (boneless, skinless), salmon and catfish. When it's all said and done, I will have consumed about 90 grams of protein. The general rule, from what I hear, is to consume about half of your body weight in grams of protein. That is a TON of food but I'm trying to get as much protein as I can. It does the body good! While I've been spending most of my mental energy getting ready for my own 48-hour event (48 miles in 48 hours), Dean Karnazes just went ahead and did his own to try to break a world record. Dean ran on a treadmill in Upper Manhattan for 48 straight hours this past week to try to break the Guinness World Record of more than 240 miles. Though it didn't happen, Karno ran over 200 miles in 48 hours. Runner's World covered it here. Geez, that certainly makes 48 miles in 48 hours seem paltry in comparison. Then again, to even be running 1/4 the mileage that he does is certainly an accomplishment. I'm now 1,142 miles into my journey and am continuing on Rt. 44 in Missouri. I'm just south of Stotts City. I'll continue west on Rt. 44 and will soon make my way into Oklahoma just missing Kansas by a mile or two. Stotts City, population of 200, was originally known as Pax and then later as Belle Plaine before changing its name to what it is now. The town saw some progress with Rt. 66 to its north and Rt. 44 to its south and has some local eateries like Hattie's Hamburger Heaven. Also, the Stearnsy Bears are manufactured in Stotts City. These bears have been featured on Hallmark and American Greetings cards in the past. I recently watched the newly released movie, "Plan 9 From Syracuse". In this documentary, we follow Ryan Dacko as he runs from Syracuse, NY to Los Angeles, CA over a 120-day period in order to attract the attention of a movie insider. Dacko is trying to get the attention of Mark Cuban, owner of the Dallas Mavericks and founder of Broadcast.com, to get funding for his yet-to-be-made horror film. Having only run a total of 10 miles at one time (10 years earlier in the military), Ryan has his work cut out for him. He needs to run about 30 miles a day for 90 straight days to get there on time. Needless to say, his body isn't so willing. He's faced with support drivers bailing out, major injuries from almost the first day, and a dwindling budget. He diagramed the run on his web site and kept the country interested. Overall, I thought the movie was just OK. It didn't start out to be a running movie and it certainly wasn't. I know this was just his way of getting Mark Cuban's attention. But, I think the movie could have been so much better if they focused a bit more on the running aspects of things. What's going on with his body? 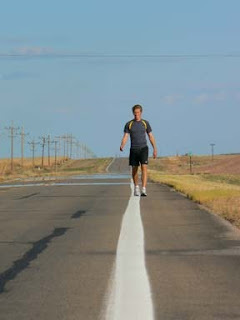 What should he be doing when attempting such a race? How should one have trained for something like this? It does give an interesting look into the human body, though. Ryan's body just started to adapt to all of those miles, though there were certainly low points. It was inspiring and crazy, which I enjoyed. It's a decent rental and you do end up rooting for the guy. If you see it, let me know what you think. 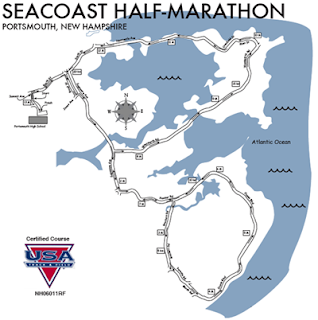 I just signed up for the Seacoast Half Marathon in beautiful Portsmouth, NH on November 9. I'm running it with a couple of friends from school, so that will make the race extra enjoyable. That, and I'll most certainly head to the Portsmouth Brewery afterward for some adult beverages and burgers. It's a little known fact that beer is a fantastic recovery beverage for runners. Dang. Now the secret is out. Since I will have run the 48 Miles in 48 Hours a couple of weeks earlier, I'm not at all worried that I'll be able to do the distance in a respectable time. Will it be a PR? Eh, I couldn't care less. Earlier this week, I was lucky enough to be featured in a post on Endurance Sports Bar, a site created by the great ShirleyPerly as part of her effort to give back to a sport that has given her so much. They highlighted my upcoming self-created race, 48 Miles in 48 Hours, scheduled less than 6 weeks from today. Thanks for the shout-out, Shirley and Stef! Check out the post here. I just recently had a conversation with a friend who was pushing me to join a gym. I think he was at least partly doing it so that it would keep him motivated and probably keep him company. And you know what? I just couldn't do it. Around February of 2007, I made my last run on the treadmill and started running outside. At the time, I was preparing for the Broad Street Run in Philadelphia (May of 2007). I hadn't done any outside running and didn't really like the idea of running outside. I resisted it at first but then the outdoors just took over. Now I'm hardly an outdoors guy. My idea of roughing it is going to a hotel without HBO. My theory on camping is that most people don't know that it's voluntary. You won't catch me out in a tent in any weather no matter how beautiful the scenery. That said, I just can't get myself to go to a gym and run on a treadmill and I definitely can't get myself to use an elliptical machine. The whole idea of it bores me to death. I'm also incapable of running on a track. The last time I tried to run on a track I didn't even make it a full lap around before I was so bored and had to run somewhere else. Now I know that I suffer from this philosophy. Winters in New Hampshire are beyond brutal and this past year's was the second worst in recorded history. That meant I was out in below 0 weather first thing in the morning or whenever I could get out. It was brutal and taxing but there was something about the idea of being outside when everyone else was indoors that made it so satisfying. I blogged about lessons learned and annoyances, so it's not all good. All in all, though, I much preferred it to being inside. I know that I'm going to have to join a gym at some point but I'm resisting it as long as humanly possible. I haven't run indoors in more than a year and a half and I'm not looking forward to starting anytime soon. I recently ran the Moose on the Loose 10 Mile run for the second time. The first time I ran this was a year ago after I landed in Concord. I really enjoyed the modified trail run (just before I dislocated my shoulder on another trail run last year), so I figured I'd give it another try this year. The race didn't disappoint. For a trail run, there are very few roots and rocks, and the trail is extremely smooth. There was some sand and mud, but it was nothing like the trail race I did about a month ago. There were few uphills and few downhills and we ran past rivers and through the woods, though we never did make it to grandmother's house. Since I'm really in training for the 48 Miles in 48 Hours run, I decided to use this as a training run more than a competition. I stayed right around 8:45-9 minute miles which was fine with me. I picked it up a bit at the end, but not by too much. It was a 2.5 mile course that we did 4 times. That's not exactly the most exciting way to do things, but you go with what you've got. I finished in 1:27:45 (an 8:56 pace). I finished last year's race in 1:21:54 but that's because I pushed myself like crazy during the last lap. I wasn't feeling a need to do that this year. PR? Nah. Do I care? Not really.